Driver Manager is the easiest tool to backup and restore your device drivers. 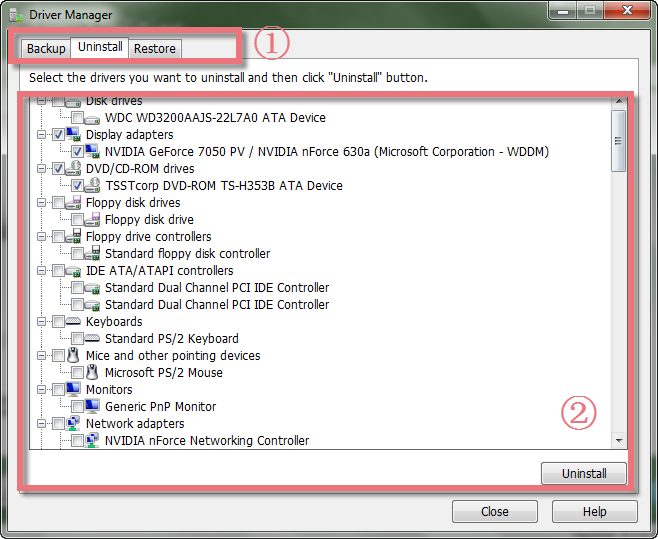 In case the latest updated drivers do not match the requirement, you can use "uninstall" to remove them. It is extremely useful especially when you're about to reformat or re-install Windows. 1. The First Line Buttons: quick access button to "Backup", "Uninstall" or "Restore" function. 2. The Big Box: displays a laundry list of device drivers with a few information on the driver name, icon, type and so on under "Backup" and "Uninstall" tab. Click "Backup" tab , you may see some entries in red color under parent entry. The red entries in Driver Manager are non-Microsoft drivers. So you’d better backup the red entries in case you lost them accidentally. Driver Manager allows you to access over thousands of device drivers for your computer. It provides a complete backup option to copy data about the drivers that has been downloaded to media device through a simple wizard. The backup function helps to keep a copy of your original Windows drivers in case of any hardware or software error or the latest updated drivers do not match the requirement that you can easily roll back to previous versions. This protects your system against any unforeseen device driver problems and offers you peace of mind during each driver update. Driver Manager not only helps you backup your PC with all drivers but is also a great time saving software for you to uninstall your useless device drivers. Its unique user-friendly interface and vast database make it the ultimate solution when it comes to getting your computer stable. 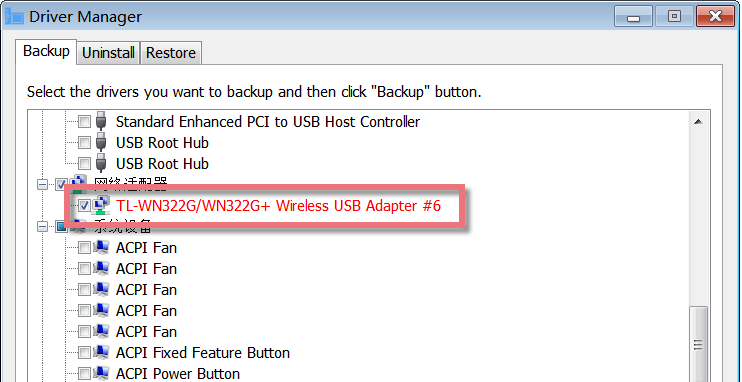 Click "Uninstall" button in the first line, all device drivers will display in the box below. It is easier to select the top parent and automatically its sub items are check marked. Or just choose the sub items, and then click "Uninstall" button at the bottom right hand corner. To make sure you want to uninstall the useless device drivers, just click "YES". Driver Manager can restore data from a backup system for the existing drivers for the latest updated drivers do not work on the requirement. 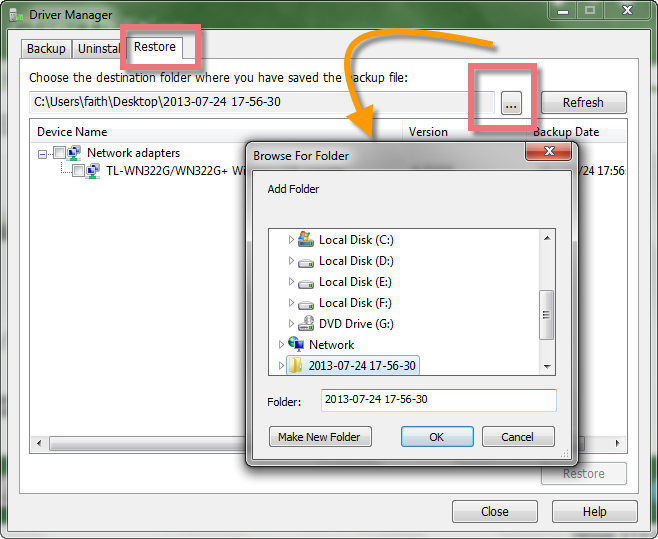 Click "Restore" button in the first line, choose the destination folder where you have saved the backup file in a pop-up window, and then click "Restore" button at the bottom right hand corner. To make sure you want to restore PCs to initial state, just click "YES". In order to minimize the data loss, Driver Manager provides users with the function to save backup files according to the user defined location. Once you have created backup files, you can save the backup files to any folder you like. Therefore, you can easily find the backup files where you saved. 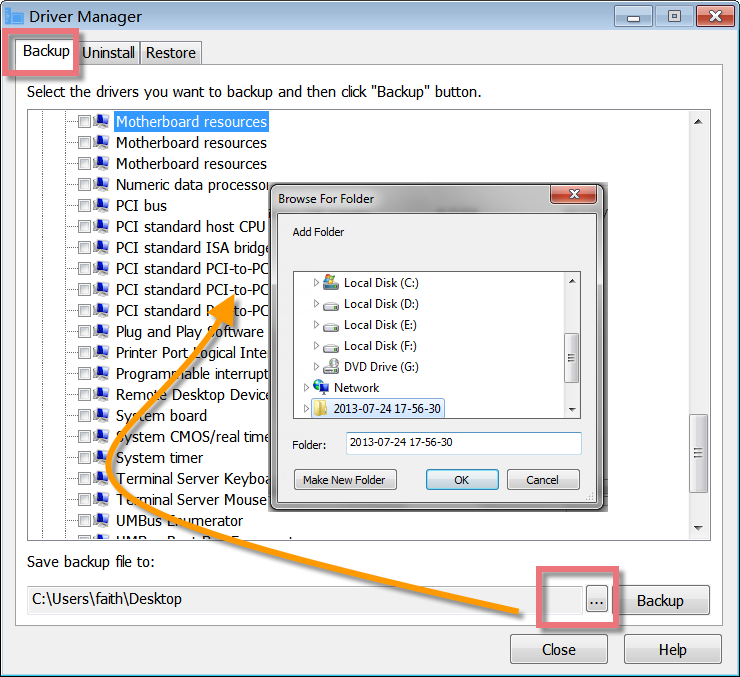 Click "Backup", "Restore" or "Uninstall" under Drivers, Driver Manager will pop up. Find and click Driver Manager icon, Driver Manager will appear. Please note: if you want to add Driver Manager in the Dock bar, click in Dock bar, remove any icon by dragging it out of the Dock firstly, and then drag Driver Manager in.